Scosche Industries is best known for their car audio installation hardware and portable electronic accessories. They are a 30-year old company that is 100% family owned; founded on a commitment to quality, value, and customer service. With over 70 patents and countless industry awards it is easy to see that Scosche is consistently at the forefront of technology and innovation. This review will take a look at the Scosche flipSYNC USBMM charge and sync cable. 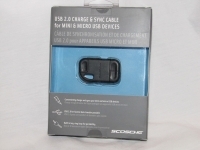 With the usage of USB connections growing, Scosche recognizes the need to have USB connections in a portable format. This handy device includes a mini and micro USB adapter in a small, self contained unit. Before taking a closer look at the flipSYNC USBMM charge and sync cable, here is some information from the official product page on the Scosche website. 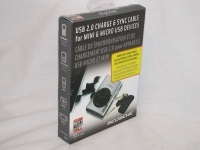 The Scosche flipSYNC USBMM charge and sync cable is packaged in a retail box with a large image of the flipSYNC in use connecting a digital camera to a laptop, as well as it attached to a set of keys to show all aspects of the device. On the side panel of the box there are a few small sketches of some of the devices you can connect to by using the flipSYNC. On the back there is a clear plastic window located in the middle of the box so the consumer is able to see the actual product and the size. At a quick glance the shape and color resembles a keyless entry remote for a vehicle.